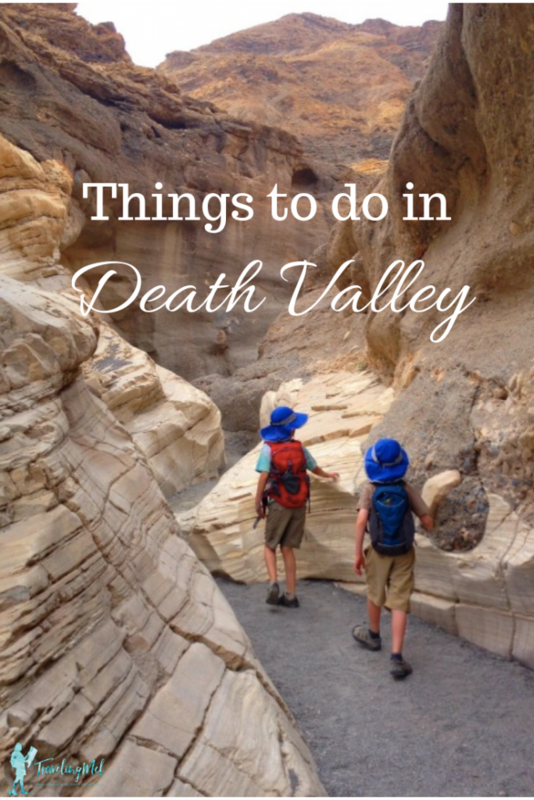 Go here: Death Valley for kids and families. We just had a fabulous five day-four night trip to Death Valley. Man, was it hot! Even for Death Valley, it was hot. It was in the high 90s in March! first thing in the morning. By 11:30, it was blazing. But, we carried on, drinking tons of water, slurping electrolytes, slathering sun screen, and hiding beneath big hats. Oh, and a dip in the Furnace Creek Resort pool each afternoon helped. 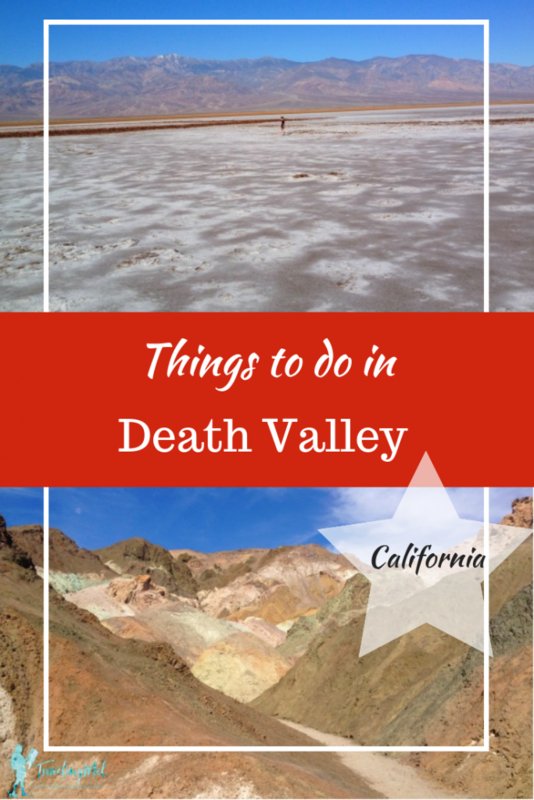 Here are some of our favorite things to see, do, and learn in Death Valley. Find the latest prices and best deals on places to stay in Death Valley. But first, a little video. Maybe we just needed some time in the air-conditioned car, but we all loved the Artists Drive. Getting into the multi-colored hills was amazingminerals in turquoise, purple, orange, yellow, brown, and more, make up the hills. We got out at Artists Palette and wandered around, climbing the small hills, finding caves, and wandering the washes. The kids also love the HUGE dips in the road that feel like a roller coaster. Top to bottom of Ubehebe Crater. Our favorite thing about Ubehebe Crater is saying the word Ubehebe over and over. Our second favorite things was walking around the edge of the steam volcano crater and looking into the bottom and at the orange sherbet-colored walls. Our third favorite thing was the amazing number of flowers on the inside of the crater. Our fourth favorite thing (or was it first?) was that it is about 15 degrees cooler up there. Our fifth favorite thing was hiking to the bottom of the crater–just Anders and I. It’s a slog on the way back up, plan on sliding back down each of the 500 feet you step up. And don’t do it in sandals. The rocks were piercing my feet with every step. Still worth it. If you walk the 1.5-mile loop, youll also see Little Hebe Crater. Little Hebe is my new nickname for Finn. This is an easy boardwalk trail that you can do even on a hot afternoon. The boys thought the pupfish were “so cute.” I think it’s amazing they can live in such high salinity and at temperatures ranging from almost freezing to 100 degrees. Tough pups! Some species of pupfish are thought to be extinct, some are threatened, but the Salt Creek pupfish are doing ok for now. Check them out while you can. Mosaic Canyon was one of our favorite Death Valley attractions. Even if you just walk the first 0.5 mile or so of this trail, its well worth it. The canyon walls are gorgeous, and the rhyolite forms short canyons or narrows, and there are lots of rocks to climb over. If you like to scramble and play, this hike is for you. We walked up to a pile of boulders that block the trail (which you can climb over on the left). We were told the boulders are two miles up, but they seem closer. The first part of the trail gets pretty crowded, so be prepared. Now we are interested: Hearing Star Wars stories in Death Valley. Our boys are Star Wars nuts. Imagine their delight when we ran into Ranger Taylor Jordan in Mosaic Canyon and he told them four locations in Death Valley were used to film scenes in Star Wars. Apparently George Lucas ran out of money or time, and when he had to re-shoot some scenes of Tatooine, he didn’t go back to Tunisia; he went to the Death Valley sand dunes. Local kids dressed as Jawas and carried a droid up a hill. There are all sorts of fun stories. If you are really into it, heres a self-guided tour to where the Star Wars scenes were filmed. Costumes not required. If you arent a Star Wars fan, check out all these other movies filmed in Death Valley. Badwater Basin is the lowest point in North America. Not really, though. That’s a climb: From 282 feet below sea level at Badwater Basin to 11,043 feet at Telescope Peak. You have to stop at Badwater Basin, the lowest spot in North America (until the Salton Sea dries up). Take a photo at the sign, walk out a little bit, then get back in you car and drive a couple miles down the road. Between mile markers 19 and 30, you can pull over and walk out onto the salt flats without the inhabitants of all the tour buses at Badwater Basin. Around mile marker 20, the salt flats get really close to the road. Be sure to taste the salt while you are there! Can you imagine how much effort the people driving the twenty-mule teams through here went through? Easier to drive around in a car and lick salt off the ground. I wanted to bring a sled for the sand dunes, but didn’t have room in the car. I was glad I didn’t shove them in, because when I watched other people with sleds, it didn’t seem to be going so well. They’d get half way down and then just stop. You need something slipperier to slide down the dunes. However, its pretty fun to climb up them and run down. And it’s really hot. We found lizard and bird tracks in the sand. If we had stayed longer (we had a bathroom emergency ;)) we would have dug into the sand to see how cool it is below the surface. We always join in the Junior Ranger programs when we are in a national park. It’s a great way to learn about the place and get to know it better. Death Valley is in the inaugural year of a Hike Death Valley program. Popular hikes in the park are given a point rating and if you get four points you get a sticker. I found completing the challenge was just the motivation Little Hebe needed to keep walking. The Furnace Creek Ranch swimming pool is a reprieve from the Death Valley desert. An afternoon dip in the pool is what kept us going late in the day. The pool is spring fed and just the right temperature. We timed it so we’d get to the pool about 4:00 pm and by the time we were back at our campsite, it was in the shade. No more sweating! This is an important part of Death Valley camping. Get a $5 pass at the Furnace Creek Resort registration desk. There are also showers in the pool dressing rooms, if you are into that sort of thing. And as long as you are in the area, you might as well get ice cream at the general store. This is a lovely walk through a canyon into bluff-colored badlands. We hiked the two-mile (round trip) to Red Cathedral. Toward the end of the trail, the canyon gets tiny and you get to climb through and over rocks. There are interpretive brochures, but the container was empty when we got there. We made something up for each of the interpretive spots. I think it was even better than what the Park Service had planned. We hit the desert in a super bloom– picture carpets of wildflowers. Actually, you don’t have to picture it, you can look at my photos. We didn’t get to see or do everything we wanted to on this trip, but we made a good effort! And we have a list of things for next time. On the east in Nevada, U.S. Route 95 parallels the park from north to south with connecting highways at Scotty’s Junction (State Route 267- Access closed until further notice), Beatty (State Route 374), and Lathrop Wells (State Route 373). There are nine campgrounds and four hotels in the park. We loved camping in Death Valley, but admittedly, it was hot at Furnace Creek (hence the name). 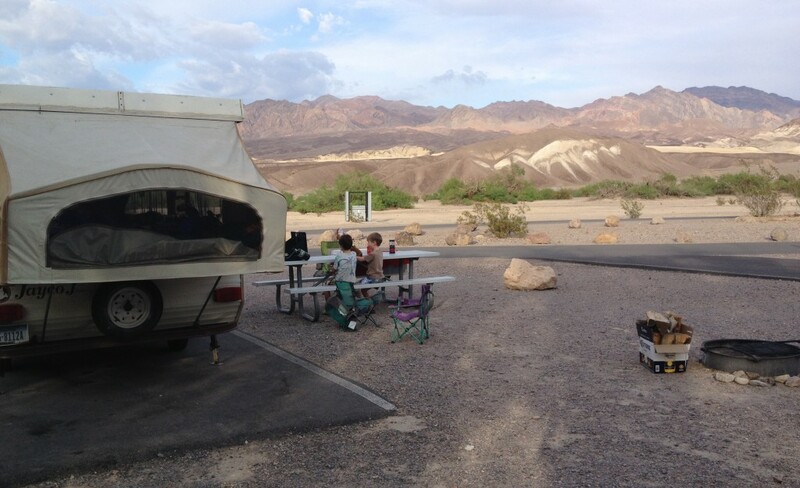 We chose Furnace Creek Campground because it is the only campground where you can make reservations and it was central to a lot of the Death Valley attractions and sights. The low elevation campgrounds aren’t even open in the summer because it’s deathly hot. Don’t visit in summer. Our friends spent the last two nights of their trip at the first come/first served Mesquite Campground and it was much cooler. Downright comfortable, actually. Reservations for the Furnace Creek Campground and group sites are available for the camping season of October 15 to April 15 by calling 1-877-444-6777 or by going online. Reservations must be made at least 4 days in advance, but can be made up to 6 months in advance. All unreserved sites are open first come/first served. 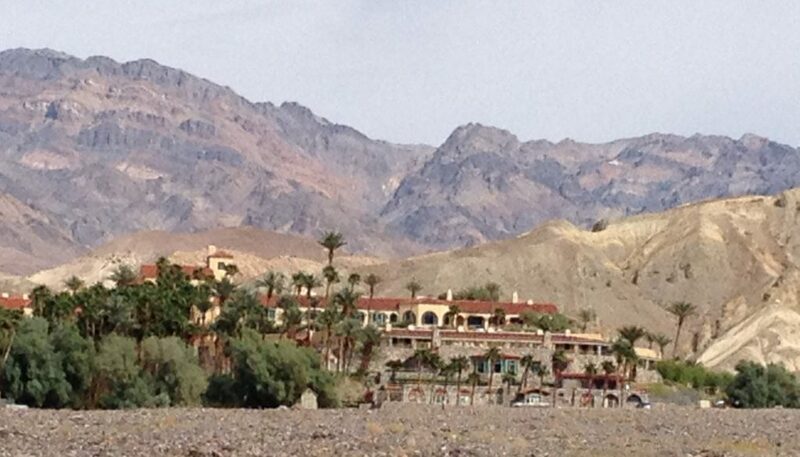 Between April 16 and October 14 Furnace Creek is first come/first served. Lodging, camper stores, restaurants, dump stations, fuel and auto services are available in Furnace Creek, Stovepipe Wells Village, Panamint Springs and in the towns adjacent to the park. Lodging and RV Parks: A printable PDF listing of all of the lodging and RV parks in and around Death Valley National Park with contact information. I’m not a kid but I loved the temperature sign at the visitor center at Death Valley, your kids must have loved it too, I think I have a picture with the sign at 107 F. The junior ranger program looks perfect for kids, I can imagine in America how enthusiastic everyone is too. The range of colors in the Badlands looks amazing, the kids must have enjoyed their 2 mile walk through there. You definitely don’t have to be a kid to enjoy any of these places, that’s just who I travel with! 107 is too hot. I could barely handle the temps when we were there. Truly impressive! Death valley is for me one of the most fascinating locations, since we have been there last year on our west coast road trip. Unfortunately we never made a hiking tour and now as I see, we truly missed something. I like how you show the diversity of this place, which is very interesting, because many people first time think of just desert and merciless sun. Great to see, how also the kids have so much fun there, really a cool family trip! Thanks! That’s the most interesting thing about the desert to me — the diversity! I can wait to get to Death Valley again. This looks like an incredible trip! It seems like you got to see a lot of things to do. Incredible how hot it gets, and quickly! I can’t believe by 11:30am it was already blazing hot. Badwater Basin sounds so cool – how unique that you can actually taste the salt flakes, and be at the lowest point in N America. It seems like there is a fair amount to do here. There is so much to see and do and it is a BIG park. There are still places I’d like to go and hike. You seemed to have had an awesome time, it seems like a fun place to visit with kids. I loved the pictures that look like moons apes, especially the crater. 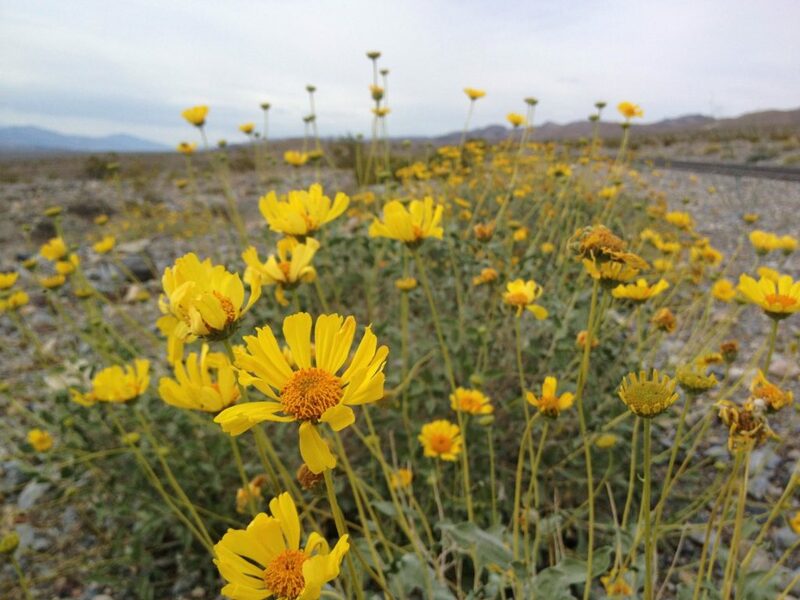 And how lucky to run into bloom in the desert… such pretty yellow flowers! Yes, I love Death Valley and to be there during the Super Bloom made this wildflower-enthusiast extra happy. Woah! 90 in March is hot – and the sign with 107?! That’s way too hot for me! I do love exploring the National Parks though and think the junior ranger program is such a great initiative. It was too hot for me, too! The great thing about Death Valley (and all National Parks) is that all ages can enjoy it! This place is unbelievable! The landscapes behind you (in the photo with your kids) looks like it’s something that is not of this world. Death Valley has piqued my interest for a long time. I am wondering why I haven’t been here yet. Perhaps a 2017 travel bucket list? You should definitely put this on your 2017 list! It really does look like another world. I grew uop in California, and yet I’ve still never been to Death Valley! Guess it really is as hot as they say, but it sure is gorgeous! Those multi-colored hills are so beautiful, and I love the flowers! Hoping to make it out to see a superbloom one of these times! I didn’t get to Death Valley until after I moved out of California! Even though it’s in the same state, it is pretty far from everything else. The whole trip sounds like a fun and filled adventurous one. I never there’s so much to see and do in Death valley, every locations looks incredible. The Artist Drive, Ubehebe Crater,Badwater Basin and ofcourse the Canyons, all of these sounds so cool even for a adults trip. Your kids are so adorable, what a great way to spend time with your family. It was so fun! I can’t wait to get back.